Trail ascends all the way through the forest of rhododendrons and Sal trees passing few villages. The trail crosses a plateau and climbs gradually for about 3 hours. We camp above the village on large grassy fields. We walk north to Khandbari. We trek further an hour via the interesting fertile villages to camp site. After staying a night at Mane Bhanjyang, we move towards the Chichila where the country side becomes rural and we will climb through bamboo forests along the ridge to Arun Than (1280m). Later on, we continue through bamboo groves and big rocks to Sheka (1350m). Trek further to a small village of Chichila, mainly inhabited by Gurungs and other communities as well. The morning at Chichila surrounds with views of snow-capped Makalu. Eventually, we meet a ridgeline with great views on either side and descend through forest by a small river where you will walk on a flat trail for about an hour to Num, which is on a ridge above Arun Koshi River. Num experiences a dramatic display of thunder and lightning every evening, which makes very interesting surroundings. 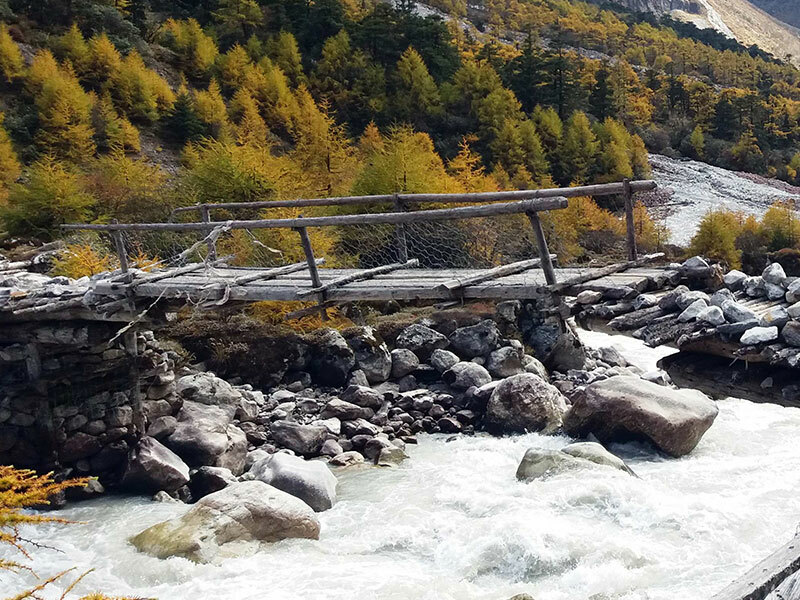 Descending from the western end of the Num ridge steeply through the cornfields of Lumbang, the trail continues over the suspension bridge and ascends through the forest and a few traditional villages.We cross the river and follow an equally steep ascent up the other side again. Often quite hot - the forest on the valleys offer a bit of shade. People of this area are mainly occupied in agriculture and crops grown here are paddy, millet, potatoes and vegetables depending on the season. Ascend continue through dense forest, eventually brings to aesthetic cam site at Seduwa. Here lies the large flat camping lawn ridge above the Makalu Barun National Park check point. We ascend the ridge from Seduwa which is enclosed by the Ipsuwa Khola on the west and Kasuwa Khola to the east, with easy hiking through the bushes. Passing the hillside through villages and small paddy fields, we reach at tropical village of Tashigaon. The camping location in this village is really an admirable site below the national park office. Finally today is the day we make it to the Base Camp. From Yak Kharka we make our way up to Merek advances through a dizzying landscape of Himalayan giants, looking marvellous views of Mountains. After arriving to Langmale Kharka we make our way up to Shershong and eventually to Makalu Base camp. The rail is flat with icy glaciers and snow clad mountains accompanying us. As the trail turns northwards into a side valley, Makalu finally soars into view. We get to immerse in the regal Himalayan panorama enclosing us. Taking the last glimpse of Makalu, we descend down from the Base Camp and headed back. On the way down, we descend through shershong, Langmale Kharka, Merek and down the valley finally stopping at Yangri Kharka. Descending through rock falls, green forest and valley from Yangri Kharka making our way towards Dobate, we follow the river banks of Barun down the trail. With steep advance from Dobate to Mumbuk (Nambuk) and through a forest of Rhododendrons we cross the KeKe La and reach out Khongma la. Through the hillsides trek continues with frequent long and steep descent. The trail takes us through thick forests and finally making to the Sherpa village of Tashigaon. And then we exit from Makalu Barun National Park and move down to the Barun River. Crossing the hillside and villages afterwards, we move further down, finally stopping at Seduwa once again. From Seduwa, we trek through the dense forests towards Num. the trail of ups and downs passes through lush forest and Sherpa villages as we move downwards. We retrace our footsteps passing the Rai & Sherpa villages while descending, and we move towards Chichira where we can savour the glorious vista of Mount Makalu for the last time. We continue downwards to Bhotebas and stay at Mane Bhanjyang. 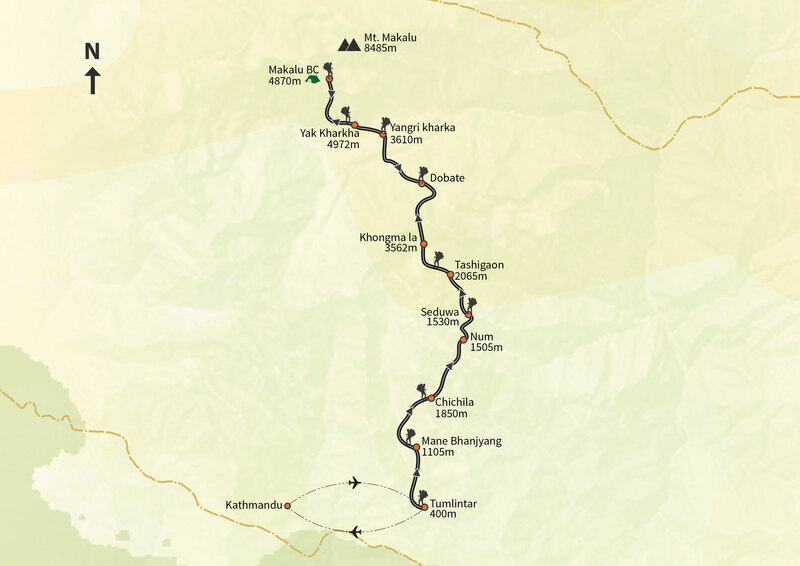 The final return leg of the trek will see us overnight at Tumlingtar, ready for an early departure to Kathmandu the following day. After the breakfast in the Lodge, you will be transferred to the Tumlingtar Airport and take a 50 minutes flight back to Kathmandu. On arrival in Kathmandu, we drive to the hotel and have some free time to relax or head into the city. Most people want to simply unwind and enjoy the hotel facilities. You’ll have a day free to roam around the Kathmandu Valley and enjoy your time. 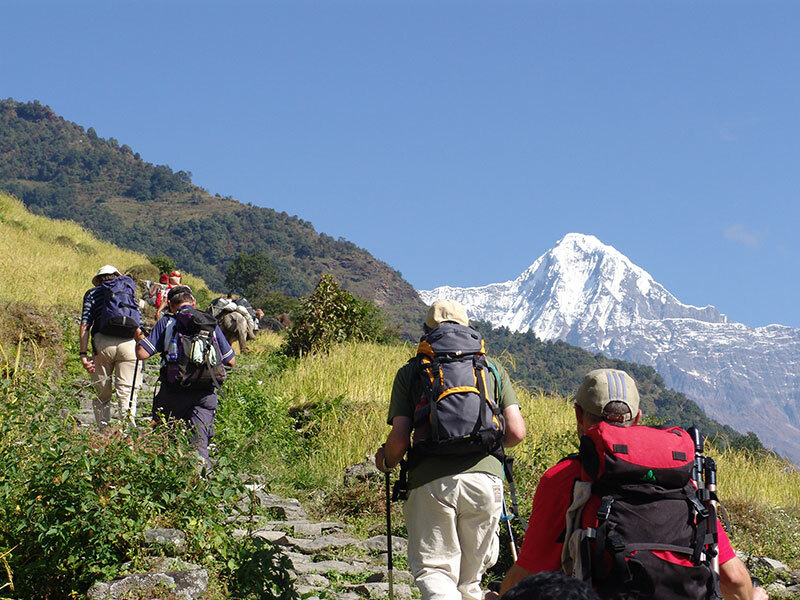 This tour spends three nights in a hotel in Kathmandu, eighteen nights on the trek in lodges (tea houses). In Kathmandu, we normally use a 3-star hotel, located within walking distance of the Thamel. On the trek, we will stay in teahouses for the most part. Some days there may be no tea house at lunchtimes – on these days we carry a packed lunch. The tea houses are basic but adequate; please be realistic about what to expect in the mountains.